I see that Edward and his family are living on Cyprus Avenue (the street name got partially cut off but it does say Cyprus Avenue). So this is another address that I can go look up to see if the house is still standing. Add that to my list of genealogy things to do. This is pretty self-explanatory information, though it does bear mentioning that at this time Edward was 41 (Zella’s age on this census is unreadable), married to Zella for 10 years and they had a total of six children, with four still living. This tells me I need to look for some deceased children prior to 1910. Using earlier census records will help me narrow down the years I need to check for those children. Sarah’s number of children is also listed so I know she had six but the number still living is unreadable. Great information to get off this census is the age at last birthday, their marital status and number of years of present marriage, the number of children born and number now living. This census enumerator has taken the time to list each person’s birth location and the birth locations of their parents (as provided by the person providing the census information). As you can see, everyone was U.S. born and most were born in the Midwest in either Kansas, Missouri, Illinois or Ohio. Column #17 is whether the person is able to speak English or not and if they were not English speaking, the enumerator was asked to list what language they spoke. The entire family was able to speak English. General nature of industry, business, or establishment in which the person works, as cotton mill, dry goods store, farm, etc. From this we can see that Edward Sr. was working but his trade and industry are mostly unreadable. I’m going to have to see if I can find a better copy somewhere. Great-great grandma Sarah was working as a laundress for a private family. They were both working on their own account. Neither one was out of work as of the enumeration date and neither was out of work during 1909. Edward Sr. and Zella are the only ones listed as being able to read and write. Their daughter, Edna, is the only one listed as having attended school that year. I’m somewhat disappointed that there’s no information listed in these columns for Edward and his family. I have no idea if they rented or owned their home in 1910. I didn’t expect to see any information in these columns for my family honestly. I know none of the last columns applied to any of them but column #31 (Union/Confederate military survivor) is great information for genealogists since it gives a clue to military service. 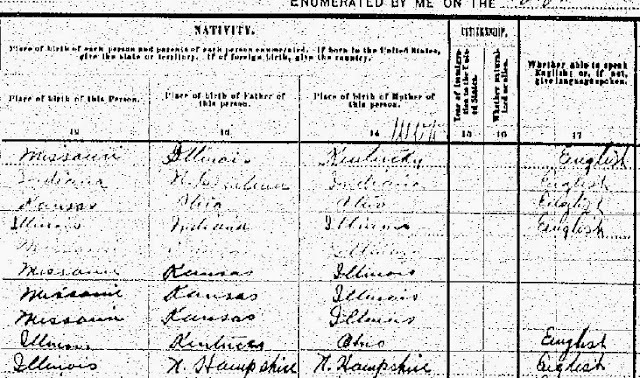 The 1910 census can contain some great information for genealogists. There are several ways to access the census records, from using Ancestry.com (if you don’t have a paid subscription to Ancestry, check out your local library or Family History Center for free usage opportunities) for indexed images to using some of the non-indexed sites and paging thru the census record pages one by one. I prefer the indexed version, however, going through page by page can wield treasures of its own. Additional family members have been discovered in this manner and it can also give you a picture of who was living around your ancestor. Next week: the 1900 census!